With all of your home needs from building supplies, toys, electronics, accessories, tools, camping and sporting needs, bikes, garden equipment and much, much more, our favourite Canadian essentials retailer with the familiar coloured currency remains your top name in everything you need to run your household. With a section for every room in your house and everything you need for the great outdoors, Canadian Tire has the essentials at prices you won’t have to compromise. Canadian Tire has a Last Minute Deals available noe! Enjoy 4 Days of DEEP Discount, up to 75% off. This Sale is valid from today, until December 24, 2018. 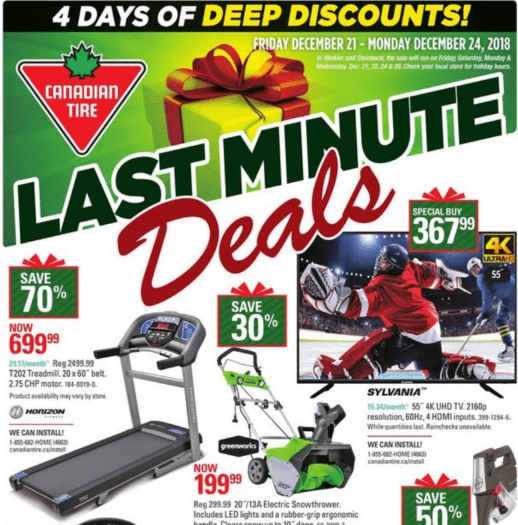 Also, Canadian Tire has a 1 Day sale on Thursday, December 27, 2018. Canadian Tire's Boxing Day & Boxing week 2018 flyer is out. There are a few good deals in this flyer. Click here to view the Canadian Tire Boxing Day & Boxing Week 2018 flyer and deals. Canadian Tire Canada has an awesome Boxing Day & Week Sale valid for 3 days only. Unbox huge saving online! The Boxing Day & Week Sale is valid until December 28, 2017. 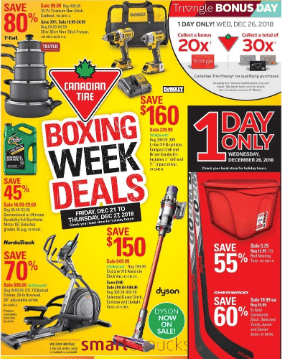 Click here to view Canadian Tire Boxing Day & Week flyer.